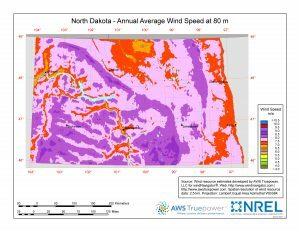 North Dakota wind potential, at 80M, is illustrated in this map. (click to enlarge) Wind resource map was created by the National Renewable Energy Laboratory for the U.S. Department of Energy with data from AWS TruePower. North Dakota is known for being windy and the potential for wind energy is great. 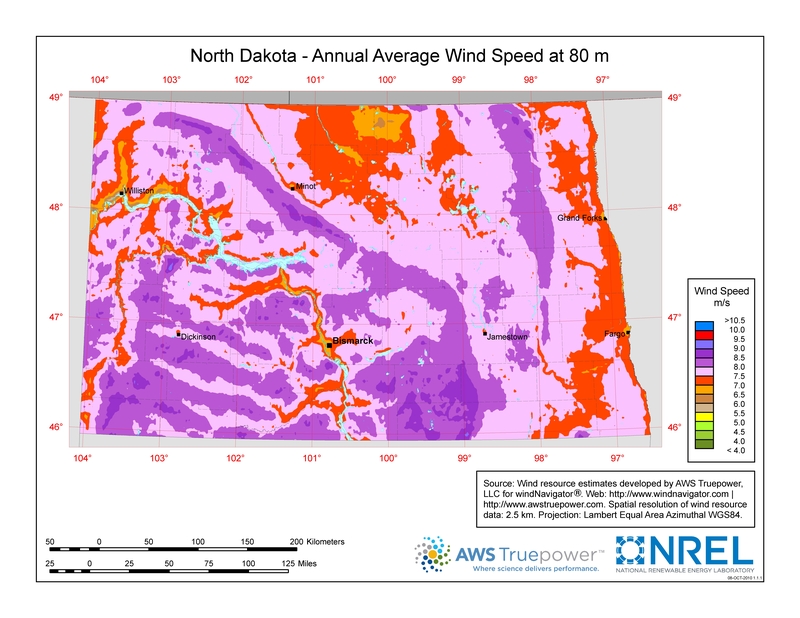 According to a study completed by the National Renewable Energy Laboratory and AWS Truepower, North Dakota is the sixth “windiest state.” Click here to view NREL’s 80-meter wind resource map for the United States. North Dakota has more than 3,000 MW of wind energy capacity installed throughout the state, consisting of more than 1,500 wind turbines. North Dakota’s wind resource is ranked sixth in the country, and the state ranks 11th for installed wind capacity, getting more than 20 percent of its power from wind resources. According to the U.S. Energy Information Administration, the national capacity factor in 2016 averaged 34.7 percent, and the American Wind Energy Association reports North Dakota’s capacity factor as 40.43 percent. Basin Electric Power Cooperative reports that its PrairieWinds 1 wind farm reached a 50 percent capacity factor in 2016. Capacity factor is the actual electricity output of a power generating facility, divided by the maximum output it could provide if it ran at full output 100 percent of the time for a full year. Download the Great Plains Energy Corridor Annual Report for a chart of North Dakota wind farms. North Dakota is home to one wind manufacturing facility. LM Wind Power, Grand Forks, produces fiberglass wind turbine blades. Wanzek Construction, Fargo, specializes in wind project installation.